Q. How do I find the Caldecott Award winner from this year? 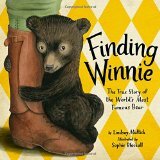 The 2016 Caldecott winner is Finding Winnie by Lindsay Mattick, illustrated by Sophie Blackall. It can be found in the Learning Resources Center, call number YE Matti. Looking for the other 2016 Youth Media Award Winners?